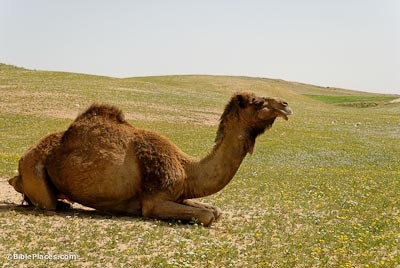 The Bible describes the ancient use of the camel (Hebrew gamal) mainly as a beast of burden for desert nomads. Camels have thick coats that protect them from the desert heat, long eyelashes that shade them from the sun, and a split upper lip, which permits them to eat thorny plants and to close their nostrils during sandstorms. Most importantly, they can go without water for prolonged periods of time—at least a week. They can lose up to one-third of their body weight in water and then replenish that loss within ten minutes. The oryx (Hebrew re’em), or aurochs, is a herbivore known for its two straight horns. A type of antelope, the oryx lives in herds and moves about the desert in search of food, and like other desert animals, it can endure long periods without water. Although it does come from the same family as the wild ox, the NIV rendering of the oryx as a “wild ox” is inaccurate. By 1973, there were no oryx living in Israel. 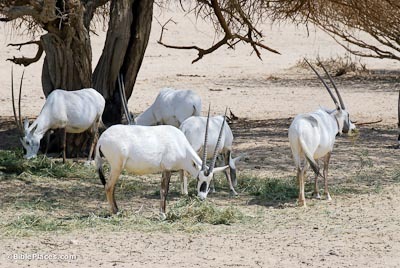 Today, 80 oryx are at Haibar nature reserve. The donkey was the common beast of burden throughout biblical times. Female donkeys could be ridden or milked, and males were good for plowing and trampling seed. Like camels and many other desert animals, donkeys can tolerate significant water loss (though not as great as the camel) and are able to replenish that loss quickly. This is because their sweat contains a low concentration of chloride. When the animals re-hydrate, their chloride level therefore remains the same, not needing to be replenished by the water. 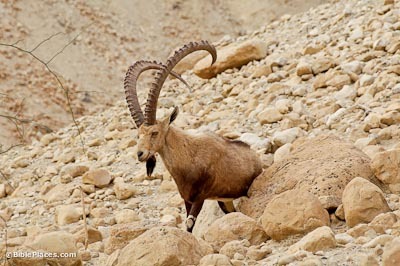 The ibex (Hebrew ya‘el), also called a “rock goat” or “wild goat” (KJV), is a large species of wild goat that feeds on green shrubs and chews its cud (it is a ruminant). Ibex are dependent on water, and make their homes near water sources. One member of the herd will keep watch and whistle if danger approaches. The cliffs provide safety for the ibex because its strong, agile legs and grooved hooves allow it to climb the rocks in difficult areas. Its hooves are like sheep hooves but are hollow underneath with a ridge surrounding them, and its forelegs are shorter than its hind legs. This male ibex is identifiable by its goatee, long, curving horns, and heavy body. 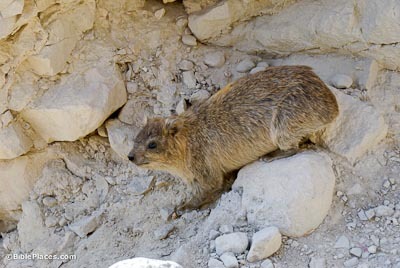 The Syrian coney, also known as the hyrax or rock badger (Hebrew shaphan) looks like an overgrown guinea pig. It can easily move about on rocks and difficult terrain because its feet have built-in suction. Its diet consists of plants and various grasses, but although it does have a three-part digestive tract, it does not ruminate. As is necessary for survival in the desert, the coney can maintain water well, but has difficulty with direct heat, and thus hides in the rocks. 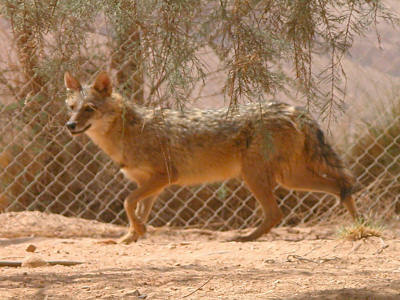 Jackals are frequently referenced in judgment passages in Scripture as a wild animal that inhabits a place abandoned by man. Download all of our Cultural Images photos! Sheep and Shepherds (BiblePlaces.com) Photos and information about flocks and those who keep watch by day and by night. Hai-Bar Yotvata Nature Reserve (The Red Sea Desert) A description of the Hai-Bar Nature Reserve with some facts and pictures of the wildlife that are being reintroduced into the environment. Hai Bar Conservation Programmes (Leiah Elbaum) A discussion of the work at the Hai Bar Nature Reserve including several pictures of animals. 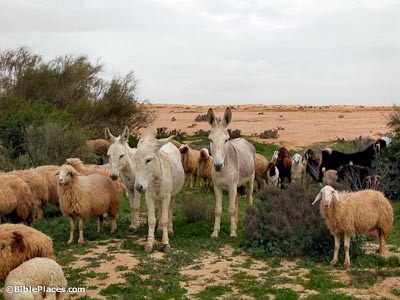 Some Biblical animal species of the desert (Tu B’shvat Environmental Program) A helpful list of many biblical animals, providing their scientific names, verse references, and other facts. Promised Land of the Ostrich (National Wildlife Federation) An informative article about the ostriches at Hai Bar Nature Reserve. 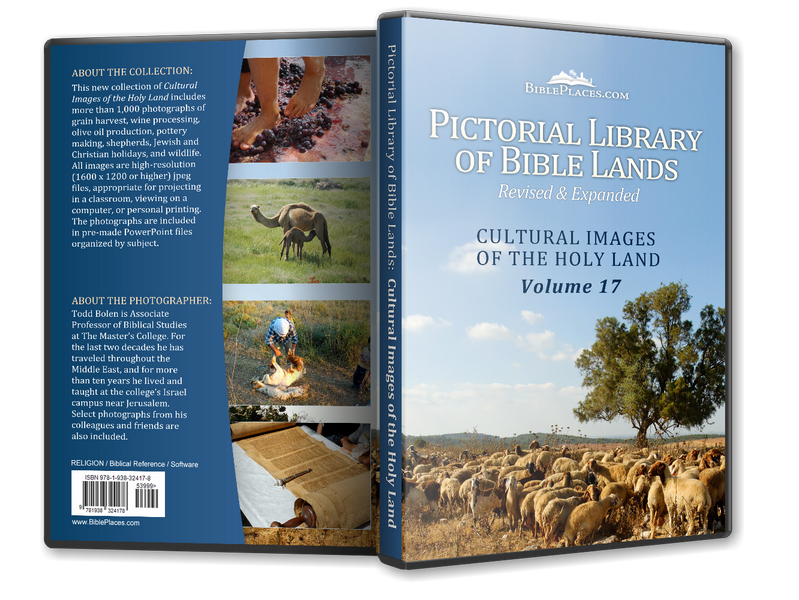 Provides many fascinating facts about these biblical creatures. Birding Israel Website (Birding Israel) A webpage devoted to birdwatching in Israel. Includes photos of several species of birds. Birding in Southern Israel (Leiah Elbaum) An extensive account of birds in various regions of the south, with pictures.